1. By leveraging the perfect combination of biometrics and cryptography, our fingerprint locks ensure double security through the fingerprint + password unlocking feature. 2. The state-of-the-art Organic LED (OLED) display affords crisp bright readouts and makes our fingerprint locks intuitive and easy to use. You can simply use our fingerprint locks with ease after following the operation instructions for once. 3. Support setting of classified privileges for super administrators, administrators and ordinary users. 4. Support deletion of all or the specified registration data. 5. Support firmware upgrade and uploading/downloading of user information and locking records through a USB pen drive. 6. Support offline view of locking records. 7. Support accurate display of time and date with annual deviation less than two minutes. 8. Support a temporary connection with back-up batteries. 9. You can set the fingerprint locks to be in the Normally Open (NO) state in special cases. 10. Support display of the battery charge level and generation of low-pressure alarms. 11. 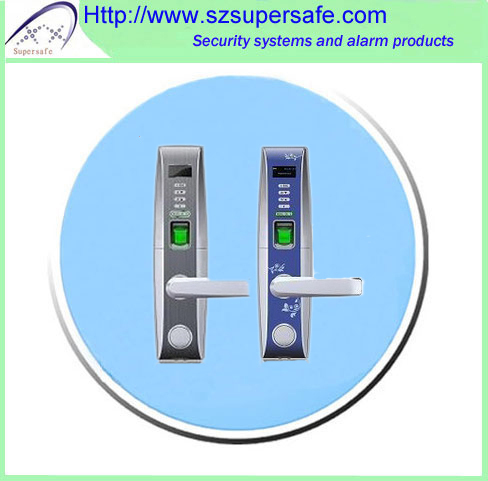 Feature an electric clutch handle design which helps effectively prevent the fingerprint lock failure caused by damage to the internal structure as a result of the forced destruction of the handle. 1. Sensor: Optics sensor without coating. 2.Capacity: 500 fingerprint images; 100 passwords; 500 users. 3. Matching mode: Fingerprint matching, password matching, MF card & ID card matching. 6. Identification speed: ≤ 2 seconds. 7. False acceptance rate: ≤ 0.0001%. 8. False rejection rate: ≤ 1%. 9. Power: Four AA batteries; working voltage: 4.2V�C6V. 10. Locking count: ≥ 4000 (Four NANFU alkaline batteries).